The Website Settings section enables you to establish defaults for your site, control the information that is displayed, and even create a site password. After logging into the ESP Website admin, locate your site and click on the Edit Site button. Click on the plus button to expand the Website Settings area and then make your selection. Note: To close the menu, click on the minus button. In this section, you are able to view your ESP Website site title, domain, language(s), analytics, status, type, and last published date. If you would like to restore your site to its default settings, click the "Reset Site" button. Note: Resetting the site does not affect saved images or content. In the Site Info section, there are two sections: Set Up Your Site and Enter Your Company Info. Edit your site information including; title, e-mail and owner name and title. Check the Display on my site box to show this information on your site. After making changes in this section, click on the Save button. 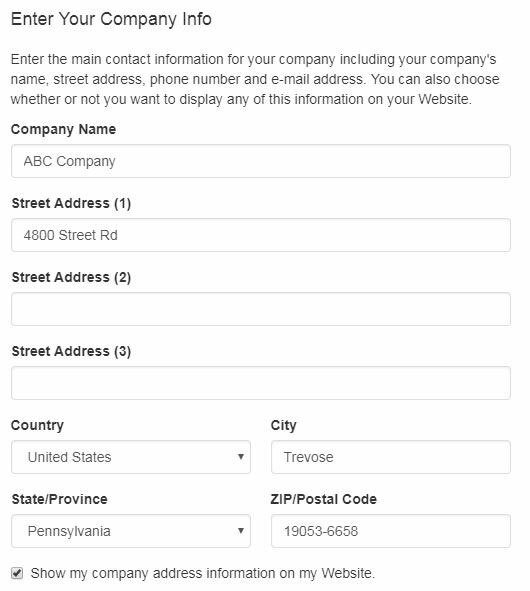 Enter your company information such as your Company name, address, and contact information. Use the checkboxes to select which information you would like to display live on your site. 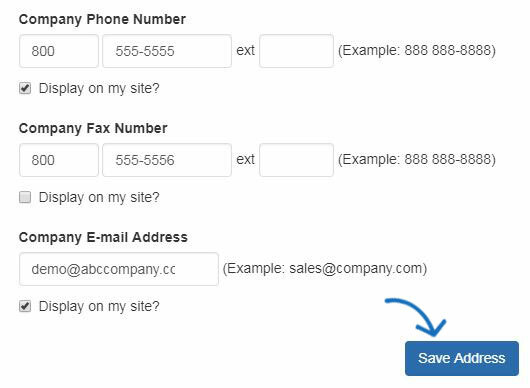 You must enter a phone number and email, even if you choose not to display them on your site. After you have finished making changes, click on the Save Address button in this area. To publish your changes, click on the Make Changes Live link. In the Display Options area, you can use the checkboxes to select which information you would like to have displayed on your ESP Website. You can use the Default Sort dropdown to change the how search results are sorted on your site. You can select Best Matched, Price: Low to High or Price: High to Low from the dropdown. The Product Option Assistant dropdown to select whether to use the Basic Version or skip this option (It is recommend that if the shopping cart is enabled you use the Basic Version). The Content Control section enables you to control which product appear on your site. By default, the "Show All Products" checkbox is selected. If you do not wish to display all products on your site, use the available options to make your selections. 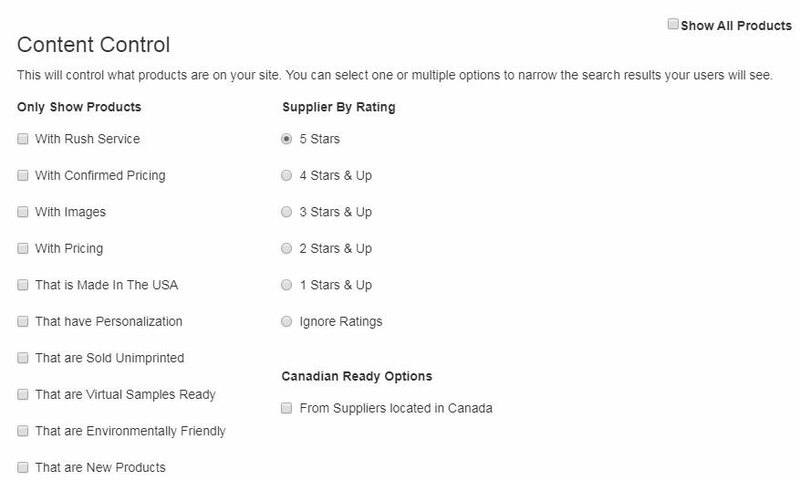 For example, if you only wanted to show products that are made in the USA, uncheck the "Show All Products" checkbox, go to the Only Show Products column and select "That are Made In The USA". You are able to check multiple options if needed. After you have finished selecting your display options and content control settings, click on the Save button and then click on the Make Changes Live link. When you purchase an ESP Website or Company Store, the domain provided will end in ".espwebsite.com" (for ESP Websites) and ".logoshop.com" (for Company Stores). All domains provided within the ESP Websites admin have an SSL certificate. To add an espwebsite or logoshop domain, click on the Add Domain button. If you have a custom domain name, you are able to redirect it to your ESP Website or Company Store. To add a domain name, click on the "Add New ESP Website Address or Custom Domain" button. 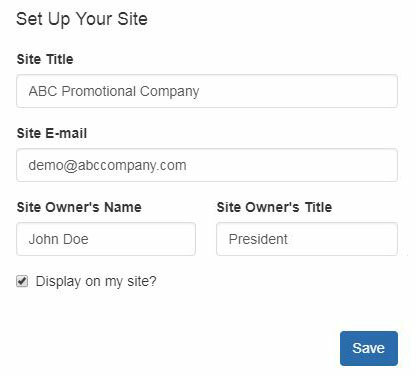 Then, type your new domain name into the field and click on the Save button. If you have selected to use a custom domain, you do not need to type "www." Just type the domain name – for example: ABCpromo.com. 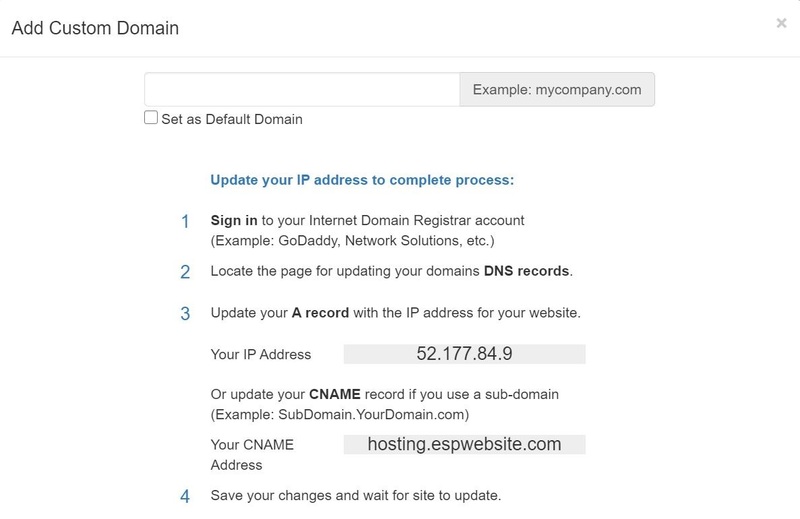 You will need to set up a redirect to point your custom domain to your ESP Website. Contact your domain host (GoDaddy, Network Solutions, etc.) and have them redirect the domain name by pointing the A record to the provided IP address (199.0.184.165). You can redirect up to four (4) domain names. Also in the Domains section, you can purchase an SSL Certificate for your custom domain. Using 301 redirects is important for ensuring the SEO ranking information for pages is maintained when moving pages from an old site to your new ESP Website. By using 301 redirects; rather than just recreating the page information on your ESP Website, the SEO weight and Google ranking for the web page will be preserved. 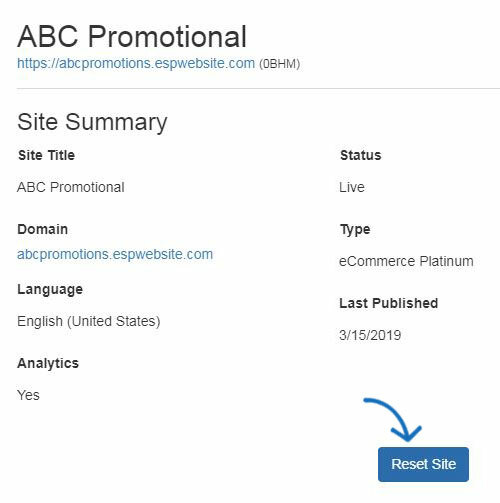 To establish a 301 redirect, log into the ESP Websites Admin and click on Edit Site for the ESP Website or Company Store. 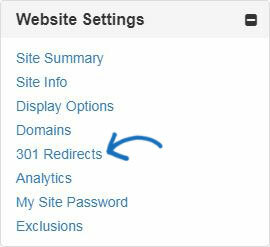 Go to the Websites Settings section and select 301 Redirects. To enter a 301 Redirect, click on the Add Redirect button and type the original page URL and the new page URL. If you have a large amount of pages to redirect, you can use the Import File button. 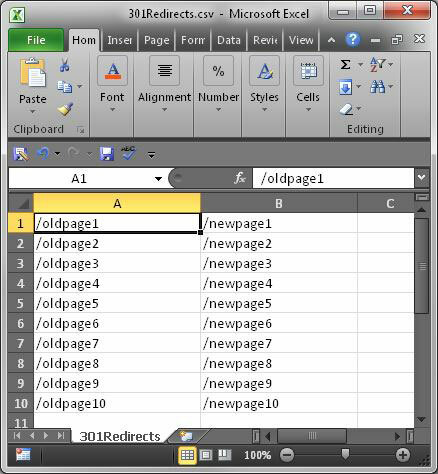 Before importing the .csv file, it is important to ensure that the information is in the optimal format. In the file, Column A should list the old page's URL extension in this format: "\oldpageextensionname". Do not include the full URL or ending (ex: .html, .asp, etc). Column B should list the page name from the ESP Website or Company Store in the same format. Do not include column headers. Once you have finished preparing the file, click on the Import File button. Browse your computer to locate the file, select it, and then click on the Open button. Then, click on Import. The newly imported 301 redirects will be listed. In the Analytics section, you can enable Google Tag Manager and Google Analytics. If you have a Google© Tag Manager account and would like to link it to your ESP Website or Company Store, you can do so checking the "Enable Google Tag Manager Service" checkbox and then entering the Container ID in the available box. If you do not have a Google Tag Manager account, you can create one for free. 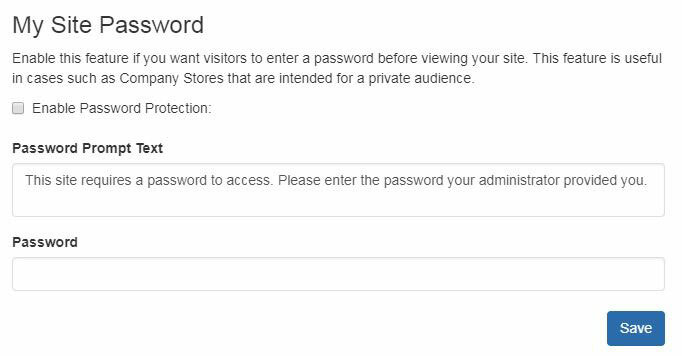 If you have a Google© Analytics account and would like to link it to your ESP Website or Company Store, you can do so in the Analytics are of the Website Settings. Check the "Enable Google Analytics Service" and enter your account number. Then, click on Save and then click on the Make Changes Live link. If you do not have a Google Analytics account, you can create one by clicking on the "Create an account" button on the Google© Analytics home page. Checking the "Enable Password Protection" box. Entering text in the "Password Prompt Text" box. Typing the password for your site in the password box. When you are finished, click on Save and then click on the Make Changes Live link. Exclusions Lists enable you to remove products, categories, and even specific suppliers from your ESP Website or Company Store. To create a list, go to the Global Features dropdown and select Exclusion Lists. After you have created an exclusion list, you can apply it to your site using the Exclusions option in the Website Settings area. Click an individual list or hold CTRL to select multiple lists, and then use the right pointing arrows to add these to the Selected List box. Use the double right pointing arrows to add all available lists to the Selected List box. Click an individual list or hold CTRL to select multiple lists in the Selected Lists, and then use the left pointing arrows to remove them from the Selected List box. Use the double left pointing arrows to remove all selected lists. Click on the Save button when you are finished. Click on the Make Changes Live to publish these changes. ESP Websites enables you to limit the categories on your site. Just like with product lists, click on a category from the options on the left and then click on the single arrow to move it onto the excluded list. 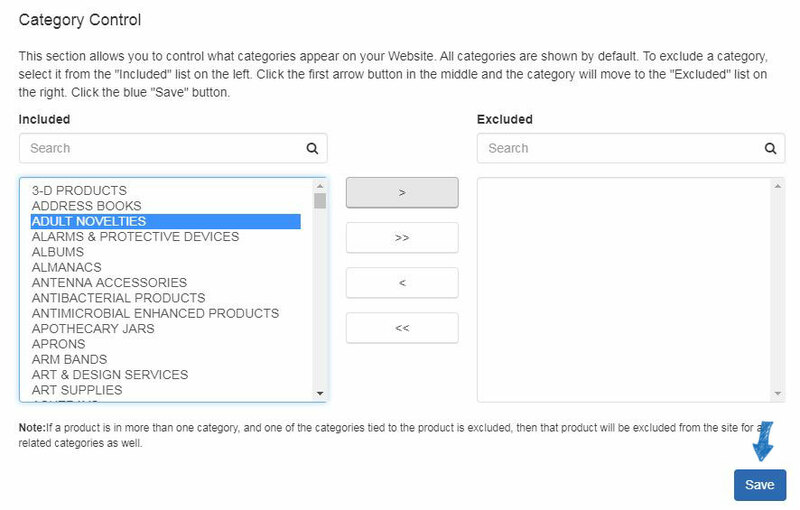 Note: A product that is listed multiple categories and one of the categories tied to the product is set as excluded from our site, that product will not appear in related categories. ESP Websites enables you to limit the suppliers shown on your site. In the Exclude a Company box, begin typing a supplier name or ASI number. The matching results will appear below and we can click on the "Add to Excluded List" button. 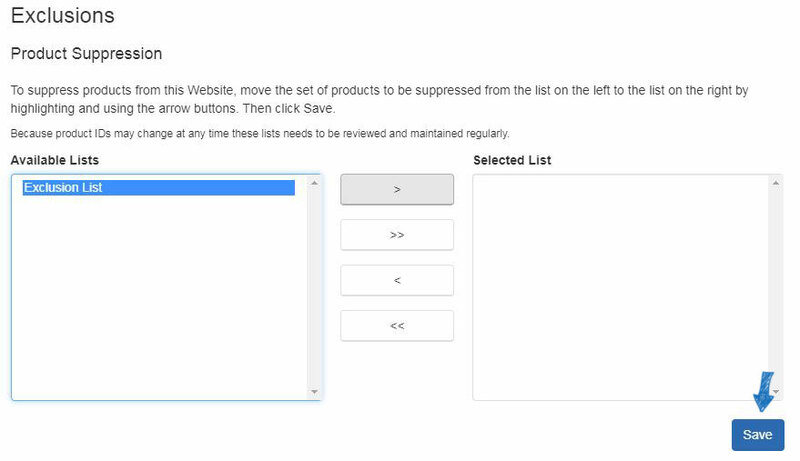 To remove a supplier from the Excluded List, hover on the supplier listing and then click on the "Remove from Excluded List" button.